I’m not crazy. Well, maybe that’s a hasty assessment, but I am confident that I’m at least not insane for worrying that a more sedentary lifestyle might be responsible for some recent health woes. Sore lower back, numb fingers, loss of energy. Sound familiar? Lately, I’ve spent more time seated in front of a computer screen than I ever have, and I have good reason to believe that a drop in movement is responsible for a dip in my health. Everyone involved in the startup scene battles inertia. Bloggers, CEOs, social media strategist, developer–regardless of the job, tech work often translates into a workday seated at a desk, looking at the computer. At least one New York Times article suggests that too much time on the bum can shave years off a person’s life. Yeah, the news made me fidgety, too (which might be part of the solution for maintaining a less walrus-like physique). Before writing about tech companies and entrepreneurs, I mostly wrote poems. Poems fit neatly in my hand, and I would pace around my apartment reading them aloud endlessly as I wrote. At work, I more resembled the ball of a roulette wheel than Rodin’s sculpture “The Thinker.” Six months into a new routine writing about startups, I started feeling worse. My diet, my exercise regimen, everything else in my normal day stayed the same except for the time I spent seated at my desk. Entrepreneur Dan McDonley experienced similar problems. All day in front of the computer caused him to feel horrible sciatica pain and elbow numbness. 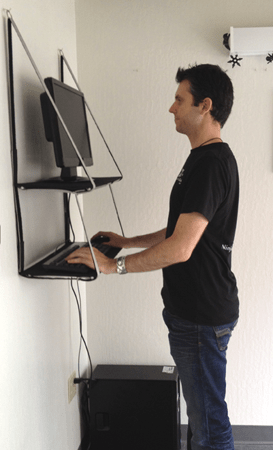 His discomfort inspired him to build a mobile, standing desk. At San Francisco’s TechShop, he spent ten months designing and building the Ninja Standing Desk. After a week of using his own invention rather than sitting down to work, his pain went away. While it is nuts to expect everyone might experience the same rapid improvement, there are a lot of people interested in exploring the option of the standing work station. McDonley launched a Kickstarter fundraising drive to finance his prototype with the goal of $10,000. The drive closed on August 17th, receiving over $33,000 in support. The plan is to begin shipments next December. Using the standing desk, McDonley felt himself “assassinating” deadlines, “slicing through his work day,” while feeling “nimble as a ninja,” hence the name of his product. The Ninja Standing Desk runs $159 minus shipping and handling. Not as cheap as a homemade number, IKEA solution, or the popular Standesk 2200, but a lot less than a more conventional desk. For the money, you get a desk that hangs from a wall, any door, or cubicle. 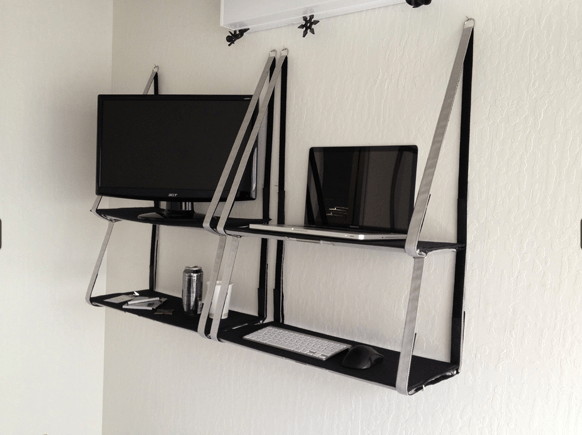 T9 military grade aluminum support allows each shelf to securely hold up to 30 pounds. 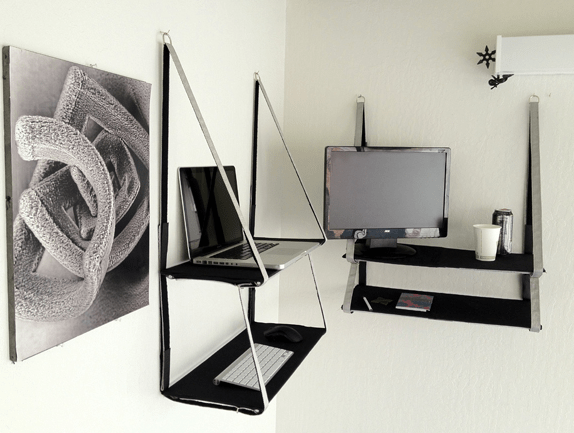 Adjustable shelves mean the desk can be used with a chair as well when you need a break from your feet. Lightweight, foldable materials intend to make transporting the desk convenient and easy. Sure, losing a few pounds from standing opposed to sitting sounds great. But to gain energy and focus, for the pain to go away? That’s a startup investment even this bootstrapping writer is keen to make.